Laurie Monahan's proudest achievements are her three daughters and marriage to Bob for 33 years. Born in Cincinnati, Ohio, Laurie has spent time between Washington, DC and Gettysburg, PA and now resides in Palm Beach, FL, and Nantucket, MA in the summer. Laurie worked and lived in NYC in advertising and film. She was a casting director and independent producer of cable shows and commercial films. Laurie also practiced Real Estate in DC and PA. Her philanthropy includes serving as chairman for several events in DC. These events include Refugees International, National Museum for Women in the Arts, Alzheimers Drug Discovery Foundation, Lombardi Cancer Center, and Choral Arts Society. 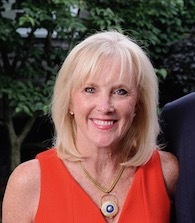 Laurie was a Member of the Junior League of Washington, D.C. Currently, Laurie is involved with The Congressional Medal of Honor Society 2013 and 2018. On Nantucket, she chaired the Nantucket Cottage Hospital Pops in 2013 and 2017. Additionally, Laurie has been involved with the Nantucket Artist's Association, Nantucket Historial Association, Save Our Sound, and International Fund for Animal Welfare. Laurie had many family members who served in the military and her father was a Major in the Marine Corps in WWII. He is buried at Arlington along with many of her relatives.